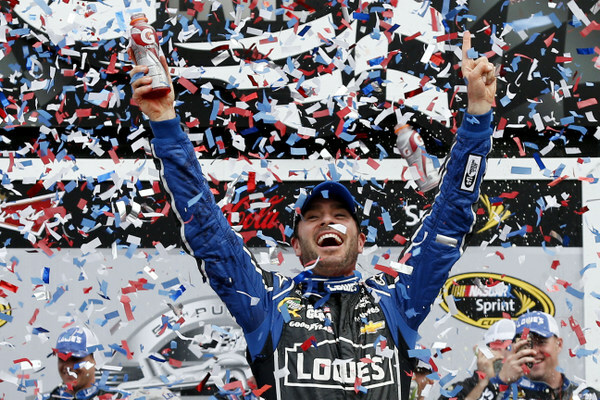 You think Matt Kenseth knows how to get Jimmie Johnson's goat? It's the mid-point of the season, with Saturday night's 400 here No. 18 of the 36-race tour, and it looks like Kenseth has figured out a way not only to beat the five-time champion, even on a good day, but to get under his skin too. Should make for some interesting moments at Daytona International Speedway. Another Johnson versus Kenseth showdown could well be in the cards. Kenseth has been hot at Daytona and Talladega for the last few years, and he was leading the 500 here four months ago....when his engine broke. Johnson went on to win that race. And the two have been the two strongest and most consistent the first half of the season. The sport's cross-country summer run -- after wins by Tony Stewart at Dover, Johnson at Pocono, Greg Biffle at Michigan, Martin Truex Jr. at Sonoma, and Kenseth at Kentucky -- follows Daytona with a 1,000-mile sprint up to New Hampshire, before taking the final break of the season while prepping for Indianapolis' Brickyard 400, to open the ESPN-ABC stretch. The scorecard: Toyota drivers have now matched Chevy drivers with seven wins each in the first 17 races: Ford drivers have three. And it's time to start making some judgments...because if a driver and team don't have things together by this point, it may be time to start looking toward 2014. Rattling Johnson may be the only way to beat him this season. He dominated Sunday's race at bumpy Kentucky, only to get snookered, maybe, on that late restart. 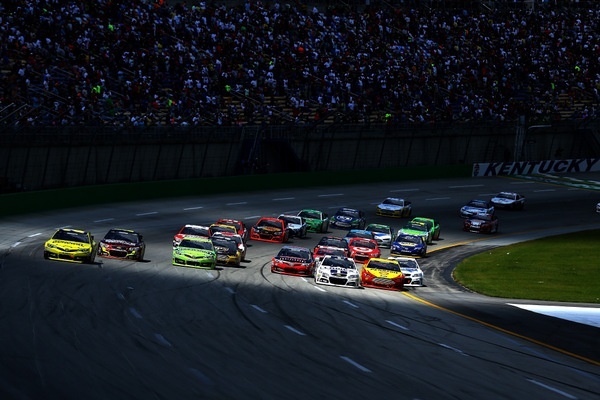 We were in an awkward situation in that restart," Johnson says. "And then we were like three and four-wide going in the corner, and something happened with the air and kind of turned me around." Johnson was sizzling about Kenseth's slow restart at Kentucky, insisting Kenseth "broke the pace car speed, which you aren't supposed to do. "But they (NASCAR race control) aren't calling guys on that, so I need to start trying that in the future." Come to think of it, Johnson was so mad at Montoya for a slow restart late at Dover that he threatened to use some tricks of his own on restarts. Twice burned now, Johnson may be ready. "Over the last month, probably since Dover (June 2), Jimmie's been very frustrated with restarts," Kenseth says. "Last weekend he just didn't have good restarts; for whatever reason his car wouldn't restart fast. "Even when he was leading and was the control car (on restarts), the one time I started under him I was still able to stay even with him, get through the gears and pass him through one and two. "He had the superior car.... it just didn't take off real great on restarts." Johnson himself isn't happy about things. "Yeah, there are a couple of bad restarts that have been highlighted and a focal point here of late," he grumbles. "But there are a lot of other great restarts...a lot of other great opportunities to win races and lead laps and pull all that off. "I know the rule. Maybe I'm a little focused on the way the rule reads exactly and paying maybe too close attention to that. Maybe I should lighten up, and loosen up on the way some restart. "There are a lot of restarts - especially during the Kentucky race -- that I brought down (for the restart), that I feel like a good citizen, a good student in doing exactly what I’m supposed to. "There are other times when I don’t feel that exactly about what happens...that it’s not called (by NASCAR), or viewed from the tower as the rule reads. "At the end of the day I’m just going to lighten up on how I think about it and use that zone and that area regardless of the way the rule reads to get an advantage and worry about myself." Kenseth, meanwhile, is still that 800-pound gorilla in the room that former teammate Carl Edwards has pointed to, in assessing the balance of power on the stock car tour. 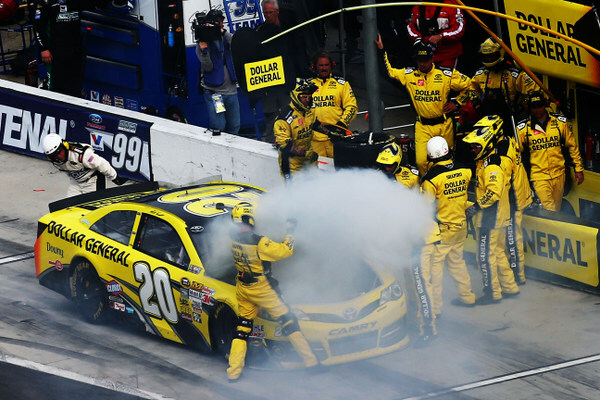 Kenseth, with Joe Gibbs' Toyota operation now, after 14 years racing Fords with Edwards, has been exceptionally fast at nearly every track this season, winning four times now and giving away a few more. That's more wins by Kenseth alone as by the whole Ford camp. So give a shout out to Kenseth's quiet, low-keyed crew chief, unsung Jason Ratcliff, whose gutsy, unexpected, no-tire call was key in the Kentucky win. And maybe save a spot for the two in victory lane here. "We've done well at the superspeedways this year," Ratcliff says. "We've been fortunate enough to lead some laps...and most fortunate to bring home the same car all in one piece. "We're going to continue to race it, until we either destroy it or it finally gets us a trophy." -- Tony Stewart. And teammates Ryan Newman and Danica Patrick.